With the advancement of technology students are becoming more tech savy. Students today are now able to communicate through technology. The stop cyber bullying website defines the term cyber bullying as "a child, preteen or teen is being tormented, threatened, harassed, humiliated, embarrassed or otherwise targeted by another child, preteen or teen using the Internet, interactive and digital technologies or mobile phones." 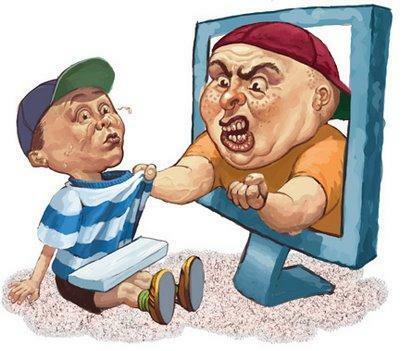 Cyber-bullying is the same as bullying, but the only difference it happens through the use of technology. Examples of technology today's is through emails, instant messaging, MySpace, Facebook, among other resources. Even our phones can be used as a way of cyber-bullying other students. As you will see Cyber-bullying is something that is common and can be hidden from parents because they at times don't know what their kids are doing such as texts they send, or what they tell other students. Ignoring the issue can have serious ramifications as you will see in the video below. Cyberbullying can be seen through educators being vigilent and being attentive to what is going on in the classroom. Educators can prevent cyber bullying if they can identify it, but ten tips can be found in the pdf below. Srt boundaries on the use of the internet, and phone texts, and make sure that you have access to their accounts and phones to check up on them. Tell your kids who to contact. Teach your kids to report cyber bullying sooner than later.